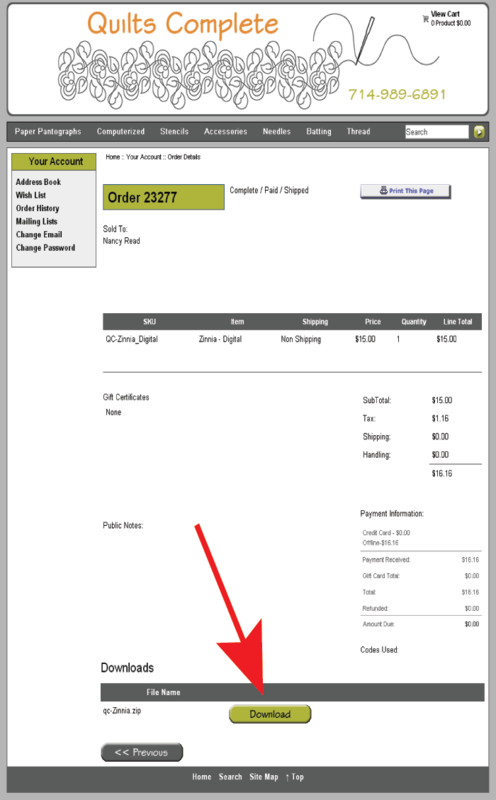 Computerized patterns may be downloaded directly from the website after payment has been received. 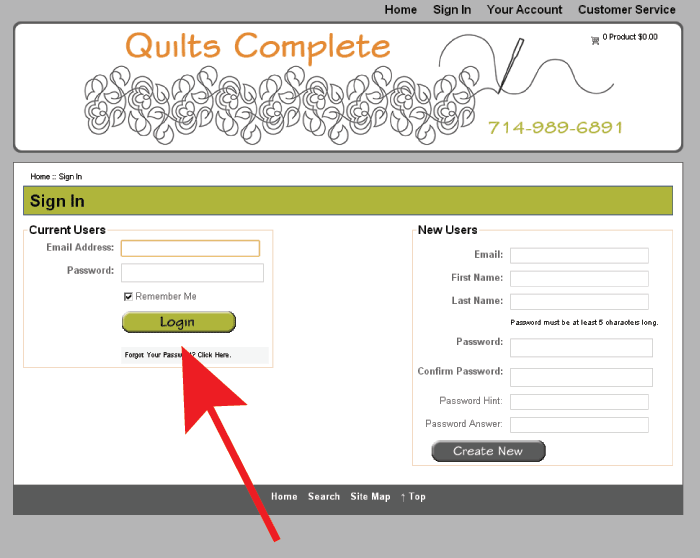 You must be logged on to the website with the email address that was used to purchase the patterns. From the home page click on the Sign In link located in the menubar just below the logo. You will now see the following page where you can enter your email address and password. If you have forgotten your password, click on the forgot password link to retrieve it. After entering your login information click on the Login button. 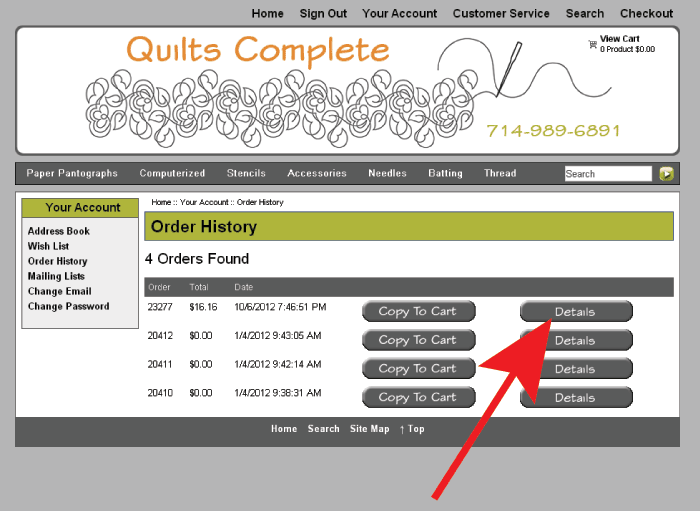 After loggin in you will be presented with a page similar to the following showing the orders you have placed on QuiltsComplete.com. Click on the Details button next to the compuerized pattern order. The details for the order will now be shown along with download buttons next to each computerized pattern ordered. You will need to download each pattern individually by clicking on each Download button. If you do not see any Download buttons it probably means we haven't processed your credit card yet. The following screen will differ depending on which browser you are using. If you are using Internet Explorer 7 you will see something similar to the following. Just click on the save button. Again, what you will see next depends on the browser you are using. You will see something similar to the following if you are using Internet Explorer 7. This screen is asking you where to save the downloaded file. Make sure you know where the file is being saved. 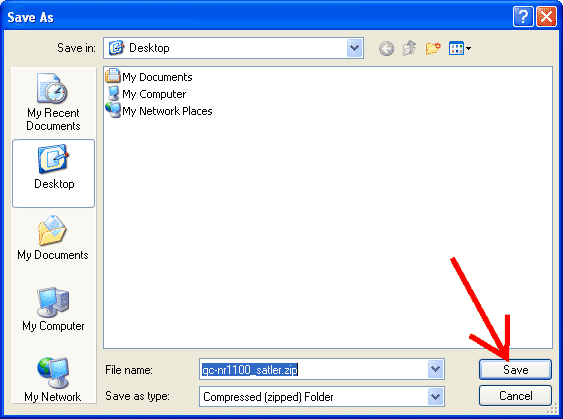 In this example the file will be saved to the desktop. Click the Save button. 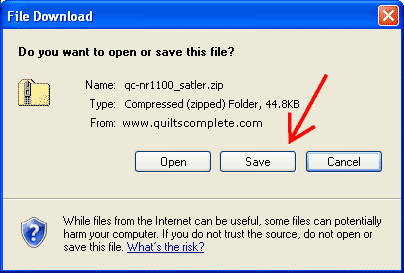 The image below shows that the download was successful and gives you the opportinity to open the file. The download file is a zip file that contains the pattern files. You will want to copy these files to your pattern directory. Cick on the Open button. The following image shows the files contained in the donwloaded file. The filenames will differ depending on the pattern you purchased. Just copy these files to your pattern directory and you should be ready to go. Please refer to Microsoft windows documentation or the documentation for your quilting machine for assistance on copying and opening pattern files.